Sabarimala is the famous Hindu temple dedicated to Lord Ayyappa located on the western ghats in the state of Kerala.The temple is situated on a hilltop amidst 18 hills at an altitude of about 3000 feet above mean sea level, and is surrounded by mountains and dense forests. There are no clear historical evidences as to when the pilgrimage to Sabarimala began. The temple was mostly unreachable for about three centuries. One of the kings in the travancore dynasty in a later generation rediscovered the original path to reach Sabarimala. It is interesting to note that it is the largest annual pilgrimage in the world with millions of devotees from all over India and abroad without any discrimination on caste, creed and religion visiting every year.However there is a restriction for females aged between 10 and 50 years. The uniqueness of the temple is that it is not open throughou the year. It is open during the first five days of each Malayalam month, and from mid November till mid January where the festival culminates at Mahara Jothi. Sabarimala is believed to be the place where Lord Ayyapa meditated soon after killing the demon, Mahishi. 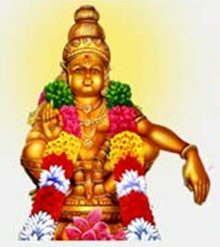 Another mythology says that sage 'Parasurama Maharshi' installed the idol of Ayyappa at Sabarimala. This temple is constructed in a typical Kerala style. The proper approach to the sanctum or the temple complex is through the revered 'padinettu padigal' (18 steps ). Only devotees who have been observing fast and carrying the sacred irumidi on their heads can ascend through the steps, and only once on their trip. Others and devotees who want to have a second darshan can use the stairs on the side of the temple. After ascending the steps you come across the big praharam, you proceed to have the darshan of 'Kannimoola Ganapathy' and enter the sanctum of Lord Ayyappa. Very rarely you can have a calm and undisturbed darshan as the the thronging crowds keeps jostling you and the security and the Kerala Police keep chasing you away to keep the crowd under control. But the good thing is you can circumambulate and keep coming to have darshan as many times as you wish. In my experience, February and March will be relatively less crowded and the last day of the Malayalam month when the temple is about to be closed for the month, you can notice the crowds thinning. 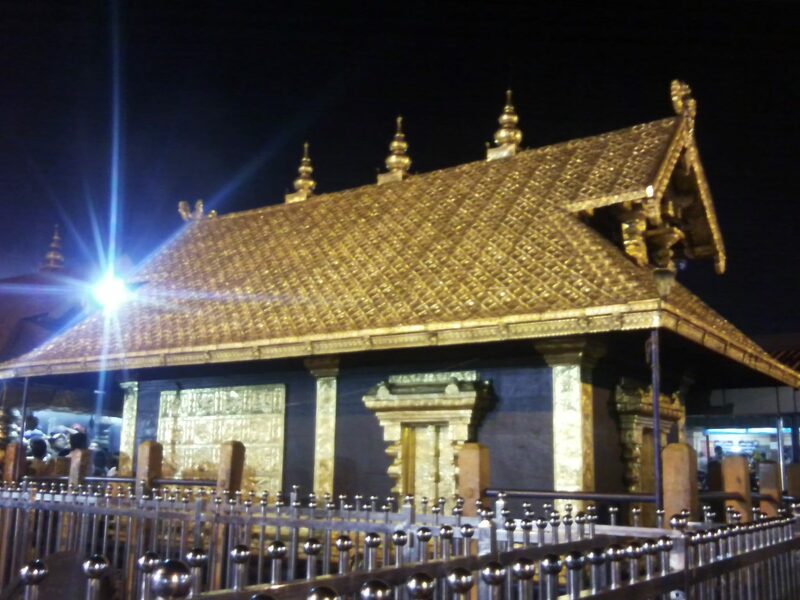 The sanctum sanctorum that houses Lord Ayyappan is completely covered with gold sheets and a mesmersing sight to behold. There are no electric lights inside the sanctum and it is a divine experience to darshan the Lord in the natural light of several oil lamps, mostly lit by cow's ghee. You will experience goosebumps as you intensely watch the Lord Ayyappa amidst the chanting of Swamiye Saranam Ayyappa ( we surrender at your feet O Lord ). To the right of the Ayyapa sanidhanam is Malikapurthuamma Devi Temple. Your pilgrimage to Sabarimala is supposed to be complete after visiting this temple. As you approach Sabarimala through road or by trek, Pamba is the base camp. River Pamba is one of the largest river in Kerala. 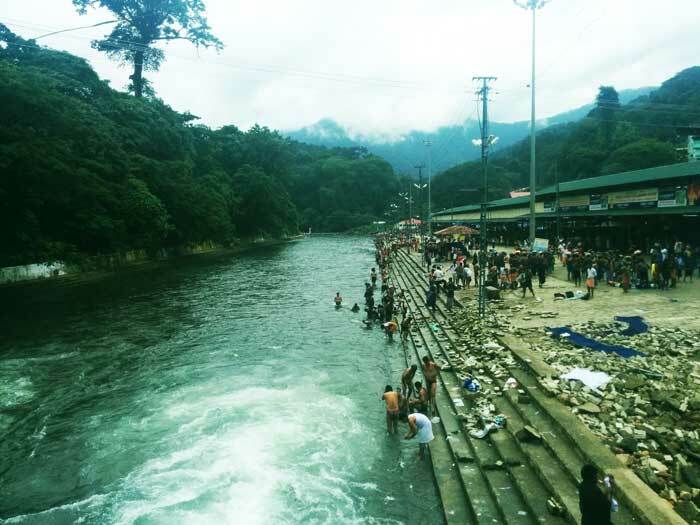 The Pamba River has been venerated as Dakshina Ganga, and devotees of Lord Ayyappan believe that immersing oneself in the Pamba is equivalent to bathing in the Holy Ganges River. Taking a holy dip in the sacred river Pamba and having a darshan of Lord Ayyappa trekking to top of the hill is the fulfillment of life's ambition for millions of devotees. 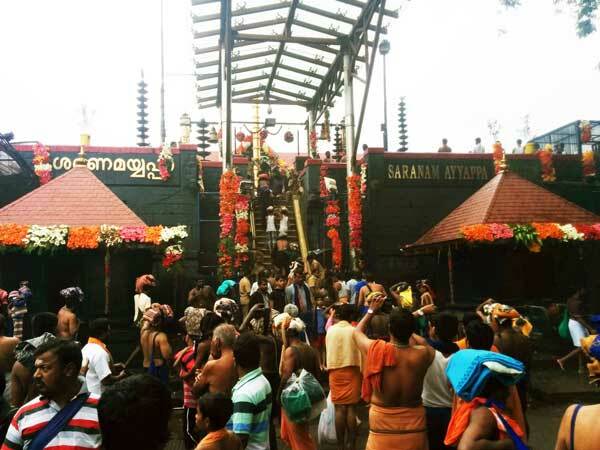 Rituals followed for visit of the Temple Swamiya Saranam Ayyapa is the chanting that reverberates the Sabarimala mountains producing a positive vibe.The devotees are expected to follow a Vratham (abstinence) normally a 41-day fasting, prior to the pilgrimage. This begins with wearing of a special Mala (a garland made of Rudraksha or Tulasi beads. The devotees are to refrain from non-vegetarian food , alcohol, and tobacco, a state of celibacy, hair-cut, shaving and even trimming of their nails. They bath twice a day and visit the local temples regularly and only wear plain black or blue colored traditional clothing. On the travel day, you will be guided by your Guruswami and he will help you prepare the sacred irumudi for the journey. Irumudi ( a long cloth bag with two pouches on either side) normally contains a big coconut filled with cow's ghee and selaed with a cork, rice, two more small coconuts, and other offerings such as honey,Kumkum,turmeric a colored cloth etc. The devotees should carry this sacred pouch on their head , putting it down withe reverence only with the help of other devotees. He should carry it on his head as he ascends the 18 steps at Sabarimala. He later breaks the coconut containing ghee to offer to Lord Ayyapa for the ghee abhishekam performed early morning. 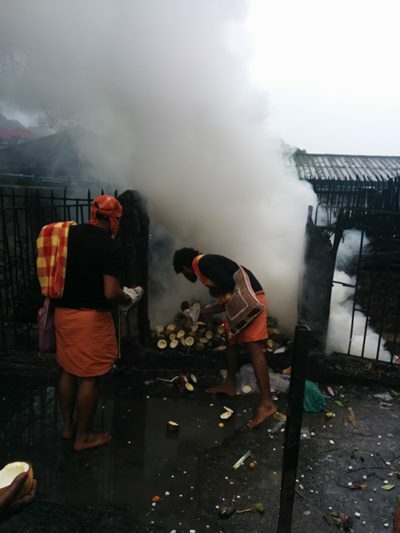 On your way back, the broken coconuts after the ghee have been emptied out are thrown into the 'Agni Kundam'. Temple Timings The temple is open for worship only during the days of Mandalapooja (approximately 15 November ) to Makaravilakku (14 January), and the first five days of each Malayalam month.In addition to these, the temple will open during other popular festivals of Kerala like Onam and Vishu and also for Atta Chithira, Nira puthari and Painkuni Uthram. King Raja Rajasekhara who adopted Lord Ayyapa as a child secured a promise from the Lord that on January 14, every year celebrated as "Makara Jyothy" all his personal jewellery will be adorned on hisidol at Sabarimala. Hence on the 12th of January every year, the Jewellery will be taken on foot from Aranmula Palace by a special emissary of the kingdom, after the puja with all pomp, devotion and reverence. Immeditely when the Arti is over, Garuda (Eagle) flies over the Palace. The Garuda flies ahead, and appears as though guiding the pilgrims throughout their journey. In the earlier days when there were no wireless communications available, to the hundreds of thousands of devotees desirous of worshipping Lord Ayyappa's jewels enroute to his abode, this Garuda used to be the sole and absolute signal of advance information even to the Temple authorities at Sabarimala to get ready for the adorning of the Jewels. Even today we can the Garuda flying over the jewel caskets as if guarding and guiding them to the Lord. This journey on the 12th and 13th of January finally reaches Sabarimala on January 14th. Immediately after the jewellery is adorned on the deity, there is an Aarti (offering by burning Camphor). The miracle is that just after the Aarti, a Jyothy ( a bright light) appears on the east side of the temple up above the Hills.The thousands of devotees vying for a vantage spots watching this erupt in rapture. Appam and Aravana payasam are the two must buy prasadams that can be purchased from Sabarimala. Devotees can purchase Appam and Aravana from the counters situated on the Southern side (leftside of the temple) at Sannidhanam. Modakamcan be purchased from the counter near the Ganapathy temple at Pampa. How to reach? 1) Nearest airport is Kochi. From Kochi, you have to travel to Kottayam or Chenganur and then take buses or private taxis upto Pamba base. 2) The nearest railway stations are Kottayam or Chenganur and then take buses or private taxis upto Pamba base. The taxis are available in plenty and mostly all are very reliable and honest. Hundreds of devotees still follow the traditional mountainous forest path, called 'Peru Vazhi' ( the longer route) (approximately 61 km) from Erumely believed to be taken by Ayyappa himself. This path is open only from the month of Karthikai (mid November) , the rest of the days it is closed and unaccessible due to wildlife. The Erumely route starts from Erumely to Aludha river, then crosses the Aludha mountain to reach Karivilam thodu. Now comes the sacred Karimala crossing, from there to Cheriyanavattom, Valliyanavattom and finally Pamba River. Then they have to climb Neelimala,Appachimedu, Sabareepeedom, and Saramkuthi. The Peru vazhi or the longer route is open only from mid November till mid January. Vehicles can reach till the holy Pamba River, which is the base camp. From Pamba, all the pilgrims begin trekking the steep mountain path of Neeli Mala till Sabari Mala. This route is now vastly developed, withmakeshift shops and medical aid by the sides, and supporting railings are provided to the pilgrims while climbing the steep slope, which used to be a mere trail through dense jungle earlier. The elderly pilgrims can travel on bamboo chairs called 'doli' till the top are lifted by four men, on nominal charges of about Rs 700 to 1000. Where to Stay? There are plenty of accomodation organized by the devaswom board, but almost all of these are always full.Devotees are advised to contact the officials of Maramath department, Travancore Devaswom Board for availing accommodation, well before they leave for Sabarimala. Where to eat? There are many makeshift eateries, but excercise caution. Being a place where hundreds of thousands visit, hygiene comes last here in many hotels. At the start of the journey, carry essential medicines such as paracetamols, painkillers, band aids, antiseptic creams, ant-diarrhea, head ache balms, anti histamines (for allergy) etc. to be on the safe side. If you are a heart patient or severely diabetic, consult your physician and carry necessary medicines. As you have to trek a long way, travel light.One change of dress is sufficient. Avoid heavy and greasy foods before the journey to avoid discomfort to your stomach enroute. If you are taking the long route (peru vazhi), do not be adventurous and wander around. Go with company. Stick to the pathway. Keep away from shrubs and bushes as you are passing the territory of the wildlife such as snakes, wasps, bees,tigers and elephants. PLEASE DO NOT THROW LITTER IN THE FOREST OR ANYWHERE IN THE HILLS. CONTRIBUTE YOUR PART IN MAINTAINING THE ECOSYSTEM. While bathing or taking a dip in the Pamba river, be aware of the water currents. PLEASE DO NOT USE SOAP OR SHAMPOO. IT IS A HOLY RIVER AND DO NOT POLLUTE. ENJOY THE SERENE WATERS.DO YOUR PART TO MAINTAIN THE RIVER BANKS CLEAN. Heavy rains during the months of June to September will make climbing the hills difficult but exciting. Carry a large plastic cover to protect your sacred irumudi. NO OTHER PLASTICS PLEASE. During November to January, it will be cold in the hills. Carry a light woolen clothind and woolen cap for your head. Enjoy every moment of the journey. It is an exhilirating experience which will make you visit again and again. Weather: Summer 23-33°C, Winter 7-23°C. Heavy rains in the hills during the months of June to September which will make climbing the hills difficult but exciting.